I’m behind on my Baby-Socks update. Halloween got in the way! We didn’t have our phone call until Friday, and it was short as I needed to get our Halloween costumes together. So, my update will be a bit short this week. Socks had another ultrasound done, and got to bring home another photo. Due date is confirmed at June 14-15. 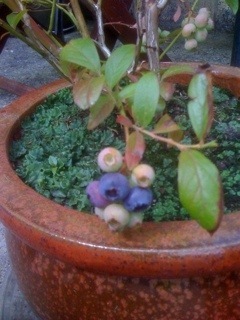 Currently, the wee one is the size of a blueberry! I love the way her baby books give her fruit similes. She was shopping for a ‘pregnancy journal’ but they weren’t very good, nothing like what she wanted. So, she bought a new Moleskine and started her own. She works on it when watching TV, until she falls asleep… she did say she’s not as tired as she was, but still much sleepier than pre-Booberry. Nausea isn’t too bad, but she gets grossed out easily – even at cartoons. No cravings, really, but she not very interested in food right now. Except bacon. Mmmm, bacon! That in itself is a bit strange as she doesn’t eat bad things like bacon very often. Her mom is finally reacting the way she was expected to all along – going bananas! Mr Socks (Bear), who is normally very shy, is telling people about their pregnancy all the time now. He’s even having conversations with male friends about “birthing plans.” I wish I could have eavesdropped on that conversation! Bear is also making sure she gets enough iron, because she can’t take those ginormous iron horse-pills right now. So happy for Socks & Bear! Liquid iron was the only stuff I could ingest..(I forget brand name..Spatone? You so crazy and I love it! I read this post while standing in a long check out line at the grocery store and I had to choke back tears for the next 10 mins. I feel so loved. Thanks for coming on this crazy journey with me. Yep, weepy preggo lady coming through! And thanks for the tip Birdie, I’ll take a look into that. Aw! No scaring the check-out staff, now!